This time of year the results of potato leafhopper feeding show up particularly in nurseries.Potato leafhoppers are a native insect but mimic retired folks because they spend winters in Florida and the Gulf coast. From there adult potato leafhoppers, Empoasca fabae, migrate between late April and early June. Female potato leafhoppers oviposit along leaf veins and clustered at the base of leaves near the petiole. There are five to six overlapping generations per year. Injury is caused by salivary phytotoxins injected into the plant phloem during feeding. Damaged leaves can have necrotic margins and severe cupping or stunting referred to as ‘hopperburn’. Leafhopper feeding on buds and meristems causes loss of apical dominance and a witch’s ’broom’ can develop in which many stems grow from the apical tip of nursery trees and may require extra pruning to improve aesthetics and train a central leader. Host plant resistance can play an important role in managing potato leafhopper damage. In general, red maple cultivars that break bud earliest in spring sustain the least feeding injury by the conclusion of the growing season. Higher levels of foliar nutrient content, particularly nitrogen, will also predispose maples to injury due to increased oviposition, nymphal survival, and development rate so don’t go crazy with early fertilization. Mites, aphids, and other pests also appreciate high nitrogen provided by fertilizer. Potato leafhopper arrival can be monitored in spring using yellow sticky cards deployed above the canopy of young maple crop or in close proximity to outer canopy foliage. 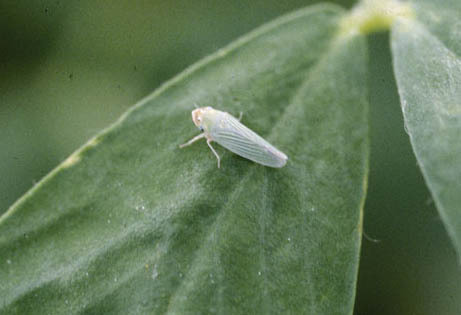 Arrival of migratory potato leafhopper adults usually corresponds to around 600 degree-days. 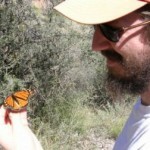 Pyrethroids can be applied bi-weekly starting at peak trap catch. However, many applications of pyrethroids may be needed to reduce leafhopper populations and damage. Pyrethroids can also cause outbreaks of other pests like mites by killing predators in the canopy. Alternatively, recent research indicates that systemic neonicotinoid insecticides applied as a drench can provide effective leafhopper control for two years. Systemic insecticide drenches need to be applied before leafhopper arrival and can help protect natural enemies within the nursery. Even though neonics can in some cases induce mite outbreaks I think it is still a less intensive approach in terms of both labor, active ingredient, and effects on non-target organisms. More information about maple pest management can be found in a recent Journal of IPM paper and free iBook IPM for Common Deciduous Trees in Southeaster US Nursery Production.